There are certain chores that we have to mentally prepare ourselves for and for many, laundry is one. Often the most time consuming part of laundry (other than the drying cycle) is sorting out all those dirty clothes. When in a rush, it's easier to throw everything in the same load and hope for the best. But, to keep your clothes bright and in good shape it's best to sort them into loads with like colors, fabrics and level of dirt. Color- sort your clothing into loads based on the following colors: whites and pastels, same color brights and dark colors. For multicolored items with lots of white wash them separately; If the colors don’t bleed then you know it's safe to wash with other clothes. Fabric- Make sure to wash delicate clothing separate to prevent tears and pulled fabric. Wash towels and comforters separate from your clothes to avoid lint balls transferring from different fabrics. 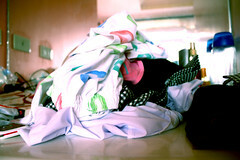 Heavy Soiled Clothes- Wash heavily soiled clothes separate from lightly soiled laundry. These easy tricks can help you avoid the aftermath of poor laundry decisions. If the overall idea of laundry gives you night sweats, it's probably time to contact Mark Pressed4T. Contact Mark Pressed4Time for all your dry cleaning, alterations, laundry and shoe repair needs.